Click Here to view our Minnesota Baskets. YAHOO!!.. Baskets On Occasion was listed in the Minneapolis Star Tribune on Dec 3, 2006 as having "the largest selection of MN themed gift baskets including the MN shaped basket and the famous "Chocolate Walleye on a stick". What a honor! WHY SHOULD YOU CHOOSE BASKETS ON OCCASION? Here are some of our customers remarks. "Thank you so much! I can�t believe you took the time to get that info for me. Now that�s customer service and I will try you again!" "Thank u very very much for today's delivery. Recipients super excited n very very happy. Thank u for helping to make their day. Five stars for service n customer satisfaction." "You shipped 2 baskets to Grand Superior lodge in Two Harbors for my anniversary in May. The baskets were beautifully done and lots of fun! Thank you so much for including the chocolate, it was a big hit. I will defintely recommend you to my friends and family!" "Thanks for your help with the MN Twins baskets; they are awesome! We delivered them today and they were a hit!" "Thank you very much. I know it must have been beautiful, as my colleague raved about when she called me Friday. Appreciate your help. Have a wonderful day." "I wanted to let you know that my recipients called to tell me they received the basket. She said it was so cute. Thank you for going the extra mile making the basket special." "Thank you very much. You guys are great! You really take the time to make your customers feel valued. Thanks again"
"We just wanted to say thank you for the wonderful gift basket. The child who received it loved it and his parents were thrilled to see him smile. Thanks again! "WOW, it is a great basket�Thank You So Much! Everyone in my dept. is eyeballing it and wishing we could keep it! I will pass your info. on to all my co-workers & friends!" "Thank you Mary! The baskets were beautiful! I really appreciate your patience and flexibility." "Thank you so much for your fast response. Your service is exceptional." "Thanks so much for the terrific basket. Our lead campaigner was very impressed. I truly appreciated your willingness to go the extra mile to get it delivered correctly. You are terrific!" COMMENTS:When I emailed the company regarding receipt of the order since I had neglected to include my email address I had a reply back promptly that the order had been placed. Great customer service! Baskets on Occasion is a proud member of these great organizations! 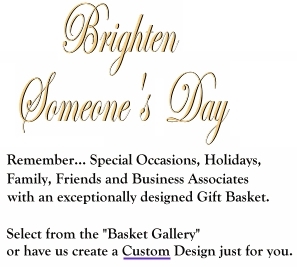 � Copyright, Baskets on Occasion, Inc. All Rights Reserved.